For years I haven’t been able to buy a wool sweater locally and I love wearing wool pullovers. About eight years ago I came across WoolOvers online – a British company specializing in fine cashmere, cotton and wool knitwear. I’ve been buying from them merino/cashmere pullovers which are fine enough to wear over a cotton turtleneck and under a jacket, yet warm enough to wear with a turtleneck alone. Over the years, I’ve built up a collection in a range of colours (and I’ve knit socks to “match” so I have an “outfit”). I get regular emails from WoolOvers – I like to see what they’ve got on sale – and a couple of weeks ago they were advertising a soft pink merino/cashmere pullover – I liked the colour so I ordered one (and while I was ordering I picked out a second in “bluebell”). These crewneck sweaters were in “unisex” sizing – now I know that’s larger than the sizing for the women’s classic crewneck sweater that I’ve been buying but since I liked the colours added them to the shopping cart and finished the transaction hoping the size I selected would be in the ballpark. Three days ago the two sweaters arrived having been intercepted by Canada Customs – to accept the sweaters I had to pay an additional $52.79! It wasn’t until I’d paid the duty, opened the parcel that I discovered just how much bigger these unisex sweaters were! Both a lot wider and longer! Not exactly a sweater for a SHORT woman! I’m now heavily invested in these two crewneck pullovers – so I decide to remake them (before wearing either for the first time) – first by shortening the body and the sleeves, then taking in both body and sleeves so these two pullovers will fit more or less like my others. I measure the body length of my classic crewneck, the length of the unisex crewneck pullover, and carefully pin and baste the bottom of the pink pullover so I end up with a seam adjacent the ribbing at the bottom (taking 9 cm out of the length). Same with the sleeves . Now, I take a VERY DEEP BREATH. I set up my serger, and carefully stitch a seam along the bottom of the sweater, in the process cutting away the excess from body. Next I tackle the sleeves. I gently steam press the serged seam allowance away from the ribbing. So, yes there’s a seam joining ribbing to body, but when it’s on it’s not too obvious. Then I mark the excess in the width of body and lower sleeve and serge new side seams and sleeve seams. And voilà – a sweater that fits! That looks good, too. Nobody is going to notice the seams joining ribbing to sweater! The Regia Yarn company has introduced a new yarn this season: “PairPerfect” – the ball of yarn comes with yellow lead threads which you cut off when you begin to knit the sock. When you’re finished the first sock you pull the yarn out until you reach the second yellow lead, remove it and start knitting using the patterned yarn again – and there you have two matched socks. I’ve never had any difficulty matching two socks using patterned yarn – although providing the leads does make it very simple – my only reservation is the patterns in the yarn are relatively boring. To liven up this striped pattern I inserted solid heels and toes using a yarn close in colour to the cuff (which is part of the patterned sock yarn). This pair turned out fine, but I don’t think I’ll use it again. Now that we’re all “old” ladies we’re looking more and more alike – easy to tell we’re related. Here we are a year earlier – the resemblance is definitely strong. And here we are in 1952 (63 years ago!) – we didn’t look much like one another then at all. The middle sister might have some photos of just the three of us – I must ask her – but I suspect she doesn’t. My mother had a composite photo hanging in her bedroom – four photos: her at 16, me at 16, middle sister at 16, and the youngest at 16. I have no idea what happened to that collage after my mother died – it was striking how similar our faces were at the same age – of course you couldn’t see it when we were side-by-side but as life progresses those family genes sure have something to say about who we become. Another pair of socks finished last night. There’s enough leftover to do a pair of legs so I’ve put that yarn in the scrap box to use sometime. With a bergundy yarn (and I have nearly a full ball) they’ll turn out fine. Never leave the needles empty – started another pair as soon as these were done. I was very happy with the crazy quilt bag I made to take to Peru. It worked very well – didn’t weigh much, held what I wanted to carry with me (including a small pack of tissues, hand cleanser, small wallet with credit cards, my Swiss army card, cloth for cleaning my glasses…). So yesterday, after I finished the quilt top and back, I got out the two leather skins I bought in New York in the spring of 2012, cut pieces for the back and front, cut lining pieces, picked up some longish zippers (I like using a zipper longer than I need and trimming it to fit – rather than working around the slide) and so after I finished pinning back, batting, and top of the quilt together this morning I made up the leather bag. It’s just shy of an inch wider than the original (9 1/2″; a bit under 9″ tall – a useful small size), with pockets on each side of the lining of the main compartment. 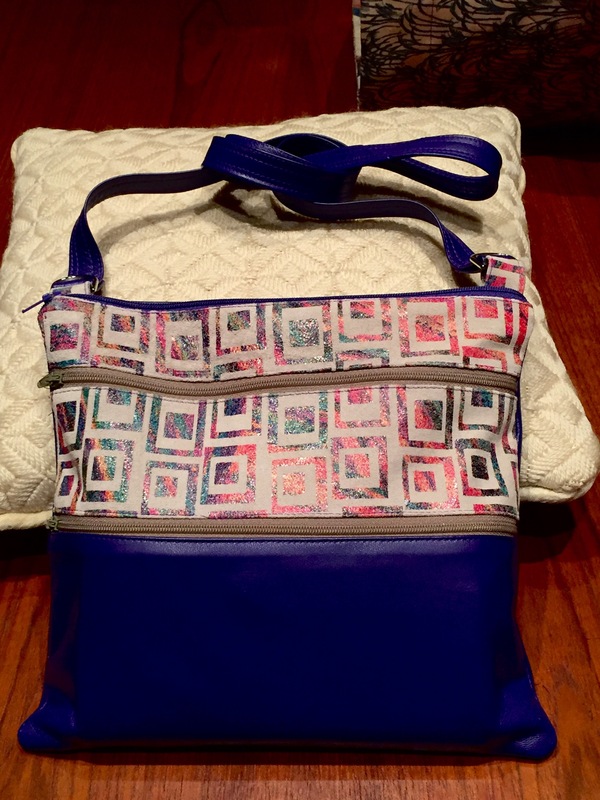 Used it this afternoon – comfortable and holds the small amount if stuff I carry with me. And wearable in the rain and snow unlike the fabric one. I bought this scarf/shawl last year. I loved the woven fabric even though the shawl itself was constructed as a closed loop. I couldn’t figure out how to wear it so I decided to open it up. 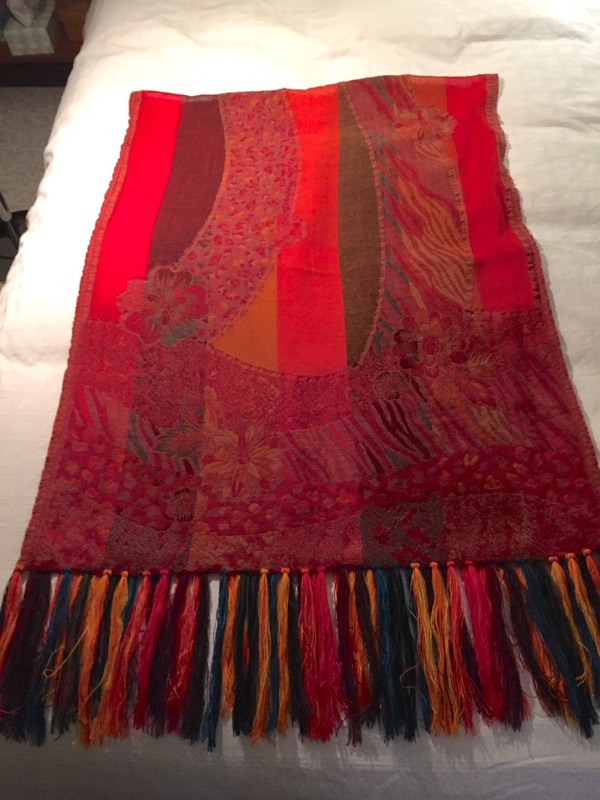 But the fabric was a bit too short to use as a shawl and too wide to wear as a scarf. Many of the small hanks of alpaca yarn I picked up while in Maximo’s workshop seemed to be in color blends I could use for a fringe on the shawl to extend the length. Added the fringe yesterday. Turned out rather well! I had it on last evening. I can see I will now use it. So here they are – done. 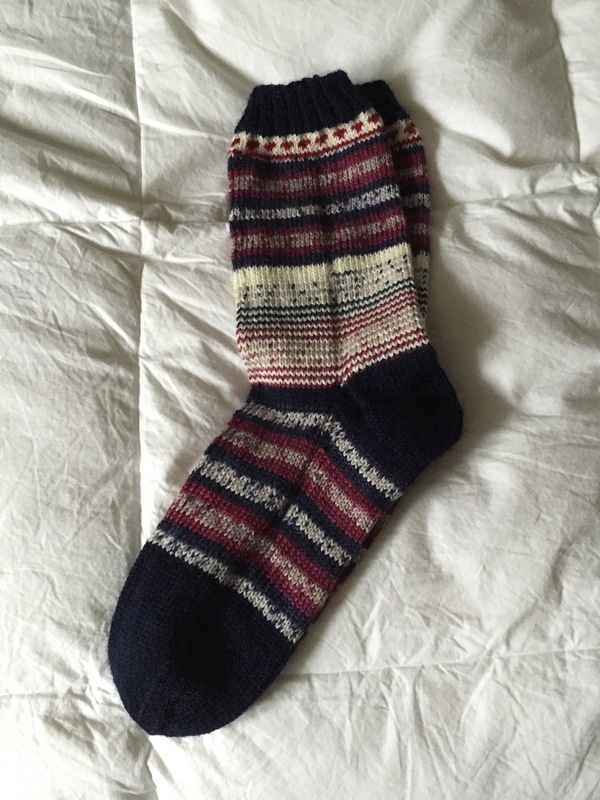 I was able to extend the leftover variagated blue / white / maroon yarn to be able to knit most of each sock with some kind of pattern. I like how the part around the ankle interspersing white and the patterned yarn turned out. Now into the give-away pile.